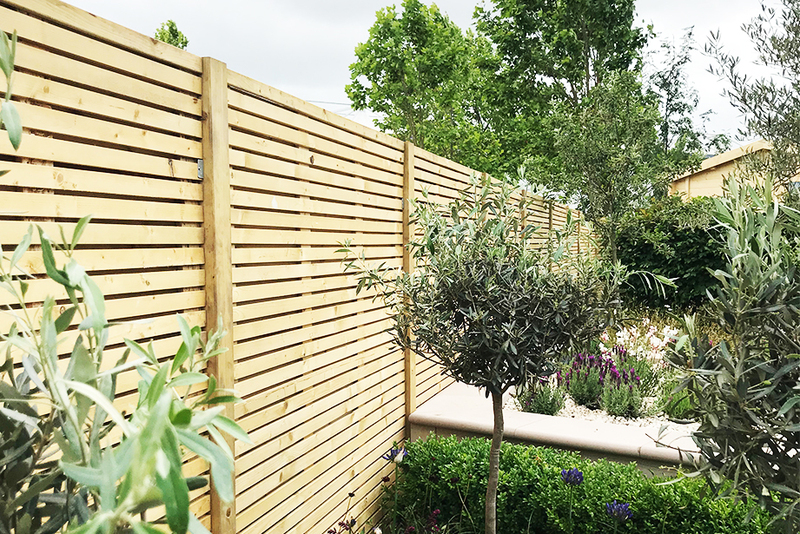 Fencing provided by Grange has played a part in earning two prestigious accolades for one of the stunning ‘Show Gardens’ created at this year’s BBC Gardeners’ World Live. The Tesco ‘Every Little Helps’ garden, designed by Owen Morgan, MD of Mosaic Landscape Design, won not only a Gold Medal, but was awarded the title of ‘Best Constructed Garden’ by judges at the show, held at the NEC. Drawing the eye for visitors, Grange’s fencing from its Contemporary range was used to form two sides of the garden. Ten contemporary panels formed a long, straight run of level fencing on one edge, with four panels along the second. Professional landscaper, Owen Morgan, said that he and his contractors were ‘over the moon with the finished result’. Talking about his experience of working with the fencing, Owen said: “Grange gave us lots of support. The company advised us on the best way to put the fencing together, the best fittings to use, and were terrific in how they handled the supply of such a large quantity of panels on time, ready for us to start using them exactly when we needed them. “The panels are fantastic, because they’re really easy to install. They’re structurally sound, square and regular, which you don’t always find with other, lower quality options on the market. With a focus on a contemporary family garden, providing spaces and activities for all ages without compromising on luxury and design, the multi-award-winning garden was designed to engage visitors with ideas and inspiration for their own homes. The multi-faceted design included an informal lounge area, raised pond, Mediterranean-inspired border, artificial lawn play area, den-making and secret garden within a wildlife area, outdoor dining area, outdoor kitchen/bar room and edible beds. Grange Fencing is the UK’s leading supplier of fencing and decorative garden structures, and has the largest range of pressure-treated garden products on the market. The company’s range of fencing carries a 20-year pressure treatment guarantee against wood rot and decay, which is the longest of its kind available. A clever new feature on Grange’s website helps homeowners and professionals alike to achieve a great garden. ‘My Garden’ allows the site visitor to upload an image of an outdoor space and add products to create a ‘try before you buy’ visual representation of how they could look.